I recently had the opportunity to interview painter Sangram Majumdar, whose exhibition NEW WORK was on view at Steven Harvey Fine Arts, New York, from January 12 through February 19, 2012. Majumdar, who has been teaching painting at the Maryland Institute College of Art since 2003, has described his paintings as being "conversations between the notion of the familiar and the questions it raises through the medium of painting." JS: How did you discover Sangram and his work? SH: I first heard about Sangram from the painters Stanley Lewis and Will Reed in 2008. I met him at an art fair I was doing and he showed me a catalog of his work for an upcoming show. I was particularly taken with one image of a still life on a mantelpiece. I thought that this painting effectively built upon the foundation of Lennart Anderson and Edwin Dickinson. I thought "what an interesting place to start from." When I saw Sangram's paintings in person I loved the way they were made, their very complex and individual 'factura.' In his second show at my gallery, Sangram's paintings continue to evolve in myriad directions from their starting point; what are the outer limits of what can be done in painting based on observation. JS: Can you tell me something about what you see in Sangram's paintings? SH: In as if... there is a figure bending forward looking through fabrics in a suitcase. It all takes place on something that resembles a creamy snow-covered futon. 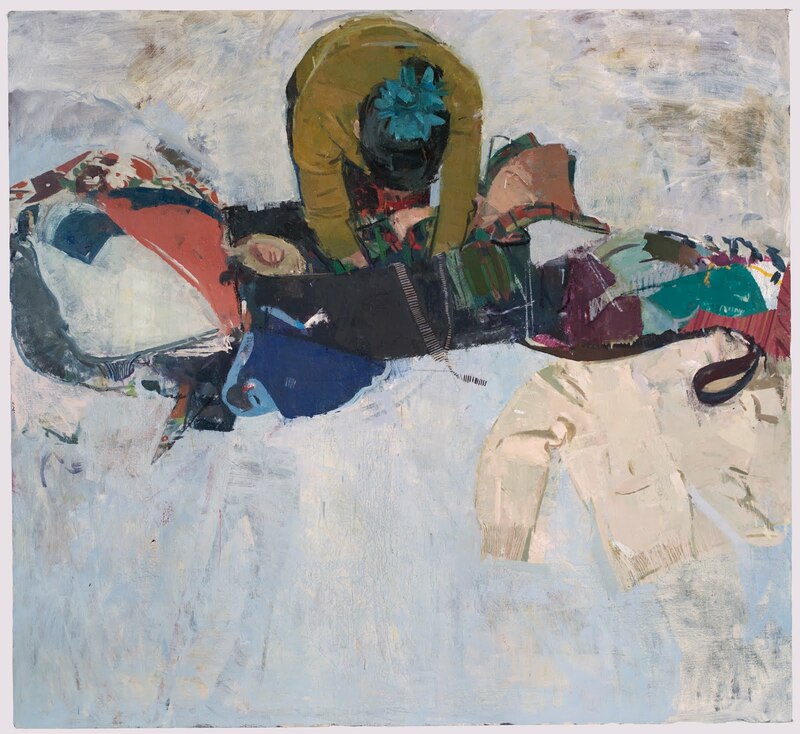 Intriguingly although the figure is boldly rendered in perspective with flowers in her hair, viewers often miss seeing the figure at first, just as in smoke and mirror, viewers often miss seeing the head of a woman who is holding the top of a turquoise colored coat rack as if she were assembling (or disassembling) it. So the viewer has to work a bit to figure out what is there. Even then it is ambiguous, an image of a woman in a mirror trying to connect the top section of a coat rack to the rest of that coat rack which is standing in front of the mirror. It is an impossible event, but on top of that, on the right side of the canvas, there is a yet more obscure indication of something that resembles a dark Indian wall painting. The way that delicate bright color drawing floats on the dark surface evokes for me, Odilon Redon and Gustave Moreau. I see a strong interest on the part of young painters in the conversation that Sangram is having in painting and I think this is representative of a very interesting moment in painting that is happening now. JS: Can you tell me about your early years in India? SM: I started drawing at an early age (4-5) and was highly encouraged by my father and grandfather. I drew everything, from still lives, to copying paintings, to cricket and soccer (football) games and Hindu gods/goddesses that are a big part of Bengali cultural identity. Looking back what seems to be a common thread is my interest in complex spatial environments. More has always been 'more' for me. JS: You came to the U.S. in 1990, along with your family, at the age of 13. Has this experience - of being born in India and coming here as an immigrant - affected your work as an artist? SM: Everything filters into my work, the old and the new, and sometimes I pull on something that is specifically biographical while other times my work has really nothing overt about it. I am not someone who likes to localize himself to a specific historical/ethnic temperament, other than the existing banner of 'painting' which is complicated enough. JS: Tell me a bit about how your interest in art emerged. What about important influences, mentors and experiences? SM: My time at the Rhode Island School of Design (RISD) was highly influential, most specifically the painter Gerald Immonen. Gerald (Gerry) was my freshman year 2D design professor and someone who until last year when he passed away, was an amazing mentor and friend. We talked about painting non-stop and his ability to see, think, and talk deeply and thoughtfully continues to have a profound impact on my painting and teaching practice. In the most circuitous way, his interest in Asian art and early Renaissance painting led me to see the shared affinities and pictorial logic between them. I live in Brooklyn and work in Baltimore, and feel lucky to have access to see some of the most amazing paintings ever made within an hour or two's notice. And based on past experiences, I am aware that artists/paintings that seem awkward or problematic to me initially are the ones that eventually win me over. Most recently I traveled through India studying architectural motifs and temple sculptures and I intend to return again for a more sustained visit. Simultaneously I am drawn to periods within specific artists or in artforms when multiple influences are visible. The early formative works of DeKooning, the Matisse paintings from 1914-1917 and the moments when Persian, Deccan or European influences weave through Indian Painting at the Metropolitan Museum of Art, all of these are places I return to repeatedly. I consider some of my favorite paintings to be my mentors, and I am amazed how they hold up to sustained looking and exploration. JS: Have you always been committed to art that begins in observation? Can you say a few things about the evolution of your art? SM: I have always been an image-based painter, regardless of the source, be it photography, working from life, or pure invention. Often the reason I start with something physical and actual is because it gives me something to fight against. There's an immediacy to the experience that gets actualized through paint. But I also work from photos, memory end maquettes. Over the last couple years, I have been doing a series of paintings that take everyday objects and 'cast' them in a theatrical manner in my studio - a place I often think of as a stage-set. Basically, I am open to all sources. Painting for me becomes a way to undo the logic, and create a space that is interstitial and ephemeral. I have a voracious appetite for all types of art, including paintings, and in my own studio I tend to jump around a range of work. I try not to be programmatic in my search, and love to play with historical, visual, and thematic conventions in painting. So, I could have a painting in progress that is a studio 'fiction' while another that is done straight from life. In my most recent solo show there were paintings that could fall into a range of visual conventions - from portraits, to still lives, to studio interiors, and allegorical narratives and of all sizes. I like the idea of a visual 'echo' in my work, one where certain actual forms or objects reappear or are re-presented in different contexts. I am interested in spaces that break logic, but hold together nevertheless. Recently, I have found myself returning to the still life genre, especially because historically it always got the raw deal, but also because it's an 'other' that can project hybrid spaces, and has the potential to play with pictorial conventions of the figure, landscape or pure abstraction. And working with found, 'nameable' forms against hand-altered and built forms simultaneously I enjoy the conversation it promotes between recognition and the strange. JS: You have mentioned that your paintings are "conversations." Can you explain this? SM: Going up to a painting is about starting a dialogue that is codependent on both the viewer and the viewed. Information is passed, ideas spring up, and feelings and memories of all types pass between the two, from the past to the immediate present, and in the best-case scenario they linger long afterward. There are a few paintings, art objects and spaces that I return to over and over again, often finding something new or surprising that I hadn't considered. In the studio I work on multiple canvases and I am always looking at what a painting that might be 'hanging out' in the corner is saying to something that I am working on. I like indirectly running into an idea, and often I leave a painting around in my studio for months in between stages before I know what it needs. It's easy to always 'talk' and think that if I keep painting, it will work. But paintings do talk back, and it's important to listen. On the other hand, my paintings often end as being a series of fragments parsed together from disparate sources, 'conversations overhead' so to speak. It's akin to how I felt when I first read Italo Calvino's novel, "If on a winter's night a traveler." In the book, the author and the reader are complicit in the experience of reading a book, a linear progression that keeps being interrupted with the reader searching for the book itself. As the book progresses, the story seems to shift as the reader realizes that there are multiple versions, translations, and possible authors. What I love about this experience is how the notion of the familiar, or 'real' keeps shifting and yet a narrative unfolds nonetheless, even if it isn't one that the reader expects. JS: What keeps you committed to painting and how do you see yourself in a contemporary context? I like Willem DeKooning's quote to Philip Guston about painting being about 'freedom' - freedom to directly go wherever the eye and the hand takes you, and also the freedom to carve out a narrative that is as personal as it is singular. The phenomena of Facebook and Twitter, is in line with the exponential nature of how we are able to find information in any form, any time. For me, choosing to be a painter is an intentional decision to work on the other side of this streaming data- the slower and the tangibility of direct human experience. But apart from being anachronistic or foolhardy, I am curious as to how our understanding of our own immediate lives, when slowed to the measure of a heartbeat, compares to our daily intake of virtual experiences. What is real? I also believe it's important to know what's going on around us. It's the same as reading the newspaper or watching the news. However I think it is equally important to know or constantly evaluate where one belongs in it and stake out one's position. 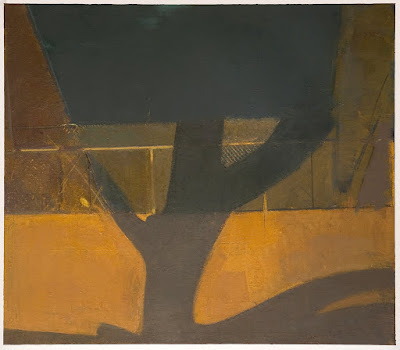 I have always been interested in artists who worked against the grain or the popular strain, from Giorgio Morandi, to Alberto Giacometti, to Philip Guston. I've been looking at R.B. Kitaj, an artist whose language and vocabulary is terribly expansive, to the point that he seems to embody multiple personalities and ways of seeing. 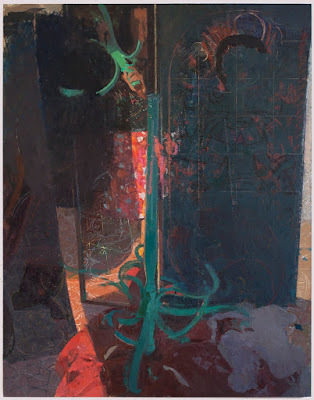 Recently I saw a show of Magnus Plessen's paintings which I'm still mulling over in my head. Beyond that I'm fortunate enough to know a range of amazing painters who are directly addressing painting, imagery, and history. It's all a big confusing and glorious mess, and history is constantly being rewritten. What's great about being a painter is that we get to play with all of this everyday. How amazing is that?